Embracing Diversity and Changing Lives! Embrace UK Community Support Centre is a registered Charity (No.1087526) and Company Limited by Guarantee (No.4215772), which was established in 1994 with a mission to promote any charitable purpose for the benefit of disadvantaged groups including migrants and refugees by the advancement of education, protection of health and the relief of poverty, sickness and distress. You can provide feedback for our site and services by using our Feedback Form. "Very effective leadership on the part of the Executive Director supported by a dedicated team of staff and volunteers"
"Comprehensive list of values and principles that underpin the vision and mission statements to 'embrace diversity and change lives’"
"The absence of any service user complaints and the complimentary feedback received is an endorsement of the high quality service provided by the organisation to its service users"
Embrace UK has been providing services to everyone regardless of where they come from. We have helped London residents whose origins span the globe. 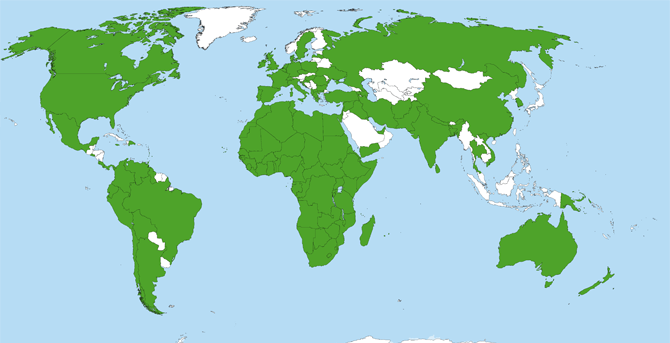 Coloured in green are the countries of origin for our service users (over 135 countries). See our careers page for available positions.